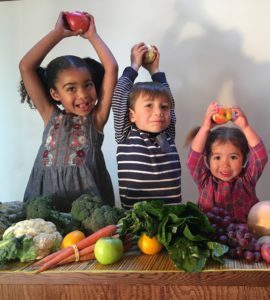 The Healthy Me Music & Movement Program is a multisensory experience designed for young children that focuses on important health topics such as nutrition, the importance of drinking water, fitness, hygiene, and social-emotional skills. 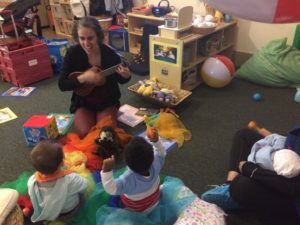 Each health topic is introduced at the beginning of each class through a developmentally appropriate mini-lesson with visuals and props (picture cards, puppets, realia) and then reinforced through singing, dancing, and instrument play. High-quality bilingual songs are written or selected specifically to reinforce the theme and vocabulary of each health lesson. The program is available in English and Spanish. The program is currently being implemented with children ages 6 months to 5-years-old at all Berkeley Child Development Centers, all Berkeley Head Start programs, and BUSD Transitional Kindergarten classrooms. Each classroom receives a weekly, 25 minute lesson for 11 consecutive weeks. The children served come from diverse backgrounds with many different languages represented. There are many second language learners and full inclusion students with special rights participating successfully in the program. The nature of the musical learning activities make the class accessible and engaging regardless of language, age, or ability. The Healthy Me Music & Movement program can be adapted to fit the needs of each individual site. The length of the program, ages served, number of students, and topics/themes covered can be determined in collaboration with the school/center staff. As an extension to the classroom program, family events can be arranged to reinforce Healthy Me lessons through music and dance.